The Northern Lights or 'Aurora Borealis' is one of nature's greatest spectacles. It comes as no surprise that the Discovery Channel found that the lights are on more people's bucket lists than any other travel experience. But can you combine an Alaska cruise with Northern Lights? Before we answer this it's important to understand a little more about the magical lights. Firstly, the Northern lights are very difficult to predict and can spontaneously dance in the sky with no warning. However, they can only be seen in very dark areas and only within the Northern Lights zone which occurs at latitudes 65 to 72 degrees. For years the majesty and beauty of the Northern Lights has led to local superstitions and beliefs. For example, Inuit people believe that the Lights represent the ghosts of hunted animals. Even today, scientists cannot predict when the lights will appear and for how long. Whilst this can be a little frustrating, it does add to the mystery and excitement of the event. In general though, the key to seeing the lights is knowing the best locations and times. This will give you the best chance. Below we discuss the options of an Alaska cruise with Northern Lights. The bad news is that the Alaska cruise season does not align with the best time of year to witness the Northern Lights. Cruise ships to Alaska depart in the summer months from May to September when the weather is warmest and the waters calmest. The Northern Lights on the other hand appear during winter when the nights are long and dark. Although the lights are actually active all-year round, the long daylight hours of summer hide the lights. During late June for instance, you'll witness 24 hours of daylight - this is known as the Midnight Sun. Whilst this is ideal for photographers and wildlife lovers, it is far from ideal for seeing the Aurora Borealis display. So what are the options? If you're committed to seeing the Northern Lights aboard your Alaskan cruise then there is only a finite amount of options - none of which are guaranteed! To give yourself the best shot at seeing the Lights, you'll need to travel very early or very late in the season. Early May or late September will be your only option. Whilst this is the darkest and coldest period of the cruise season, the Lights are still not commonly seen. There are no statistics to give you a likelihood of seeing the lights in these months, but we can say with certainly that you're more likely NOT to see them. This is mainly because cloudy nights are more common than clear ones. So to get a night that is both clear AND displaying lights is unlikely. Obviously, the longer your cruise, the more chance you have of seeing them. If you do manage to see the Lights above Glacier Bay or anywhere else within the Inside Passage, it will be a sight to remember! True winter darkness starts around November and goes through to late February. These months are the best time to see the Aurora displays at their best. Another option to consider if you're travelling in May or September is taking a cruise tour. A cruise tour or 'cruisetour' as they'e commonly called, essentially combines a standard Alaska cruise with a land-based trip afterward or before your cruise. Many of the established cruise lines offer this package such as Holland America, Royal Caribbean, Norwegian etc. This means that you can visit the city of Fairbanks after your cruise which is one of the best places in the world to see the Northern Lights. Once again though, in May and September there is no guaranteed sightings of the Lights. There are also other tours like gold panning and similar in this area. Fairbanks is a standard destination for cruisetours, as is Denali National Park. For more information, click here. If you desire to see the Northern Lights more than you do a cruise, then there are other option. 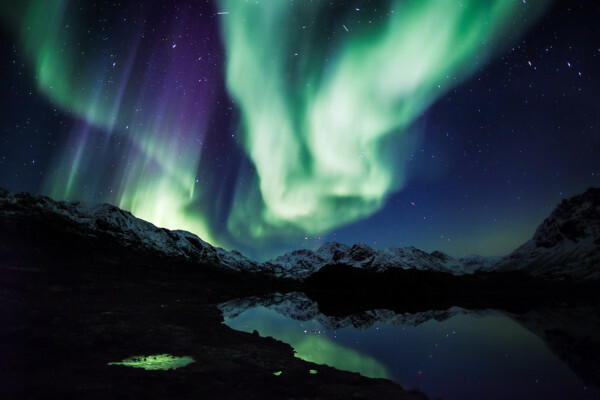 To guarantee seeing nature's great illumination, you will have to forgo an Alaska cruise sadly. If you only want to combine a cruise with guaranteed sightings, you're best (and only) option is to take a winter cruise in Norway with Hurtigruten. Some of the cruise actually give you your money back if you don't see the lights! Because many of Alaska's coastal towns are easier to reach by water, there is an amazing ferry system that covers 3,500 miles of Alaska's coastline. If you can stomach not taking a water summer cruise in Alaska, then you could always just visit in winter, take a long ferry journey on a clear night and witness he lights above (if they display). If you value the Northern Lights over a cruise, then the obvious option is to simply visit Alaska during the dark winter months when the Northern Lights are most active. The best option is to fly into Anchorage or Fairbanks and book a Northern Lights tour with a local company. These tours are run by experienced guides who will take you away from the city lights to areas that are both dark and beautiful. A proper Lights tour is also ideal because your guide will know the best camera settings for taking pictures and be able to predict (better than you) the best nights for seeing the displays. If you have any queries or questions regarding an Alaska cruise with Northern Lights, please feel free to contact us or leave a comment below.